Henry Runge was a banker and merchant. 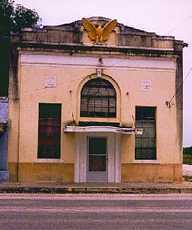 Runge�s Company was instrumental in developing the town in 1887 � the year it was granted a post office. 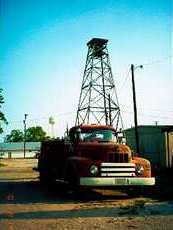 In a few short years it became the largest town in Karnes County. The Runge Town Company managed the town until it was incorporated in 1912. At that time Gus Tips, agent for the Runge Town Company became the towns first mayor. A school built in 1917 burned in 1930. Gus Tips assisted in the formation of two banks in Runge, and much of the city�s progress is attributed directly to this one man. A tornado hit Runge on May 6, 1930 killing 27 people and injuring 34. This partially explains the present size of the town�s downtown section. The Runge welcome sign also supports a birdhouse � a nice touch we wish other towns would employ. Yet another tragedy hit Runge in 1992 when the town�s historical museum was destoyed by fire.